Someplace else… – …STILL CRAZY AFTER ALL THESE YEARS! 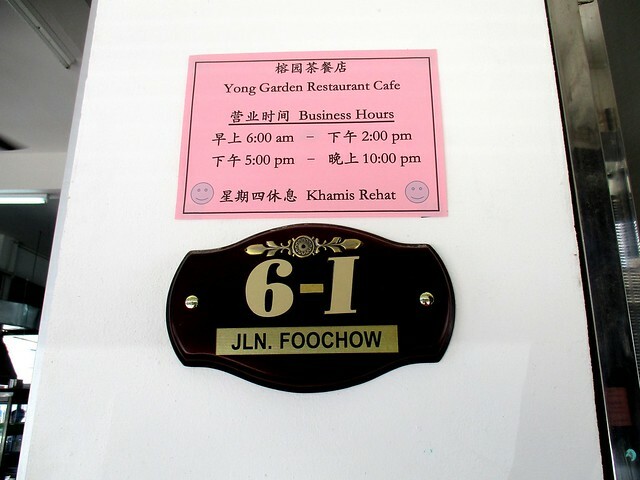 My friend/ex-classmate, Robert, was telling me that the guy here had moved someplace else further in along Hock Chew Kay (Foochow Lane) and likewise, the kolo mee lady from here. 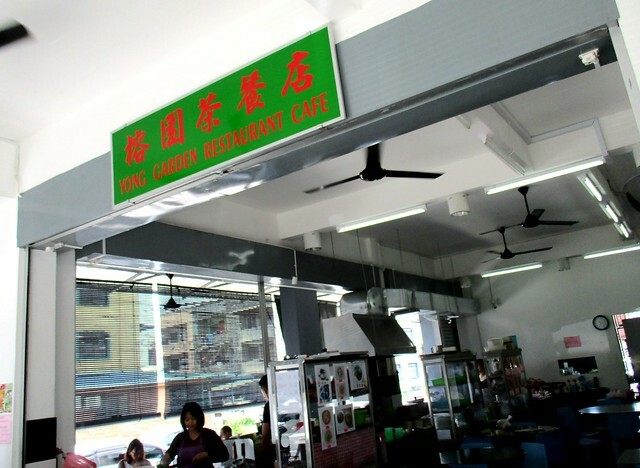 I did not really like her kolo mee – I thought it was not quite like the real thing and as for that guy, that was the only time we had what he dished out. No, it was very good but somehow or other, for no reason in particular, we never went back. …or at least, I thought that would be the one. In fact, I did drive past that day when I was in the vicinity to look for the celebrated Ang Kau kampua but it was not my intention at that point in time to go and check it out. – stewed pork noodles, with half an egg and green vegetables by the side and he said that somebody else suggested that to him, an ex-student from our school. It was all right though I would not say that it really tickled my fancy. I am not all that fond of all that sauce with tossed-dry noodles like the wanton mee that I had had before at some places. 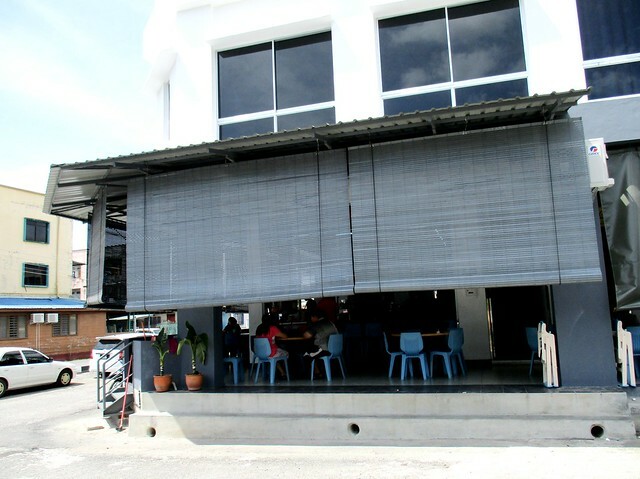 I was wishing the whole time that they would serve the stewed pork with rice the way they do it here – the meat was very nice, very well done and I was sure I would enjoy it a lot more with plain rice…and at RM5.00 only, it would be very much cheaper than that other place (RM7.20, if they had not jacked it up since). …which for reasons only known to them, had two pian sip in it. Yes, this was very very nice, a perfect balance, not too overpowering with the taste of the liver and the traditional Foochow red wine. …so for fear of a gout attack, I just had a bit more and left the rest behind. Maybe next time, I can ask for less liver and a few more pian sip instead. …and they are closed on Thursdays. …and yes, I would say it was quite nice, a possible option that one may want to consider picking from the many choices from the three stalls at the coffee shop. I did not see the aforementioned guy though but there were two sections to the coffee shop with a lot of very large dinner tables all around so perhaps, the guy will only show up at night or probably, around lunchtime at the earliest. I would be happy to have a bit of everything. Foochow noodle has a lot more sauce/gravy than your stewed pork noodle. I guess that’s the way it comes. 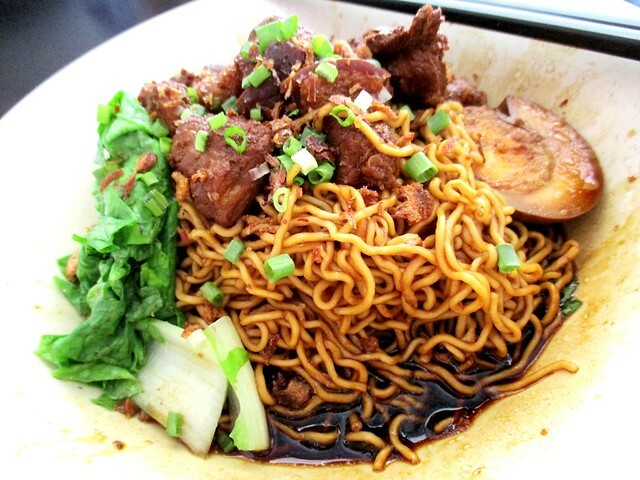 That Foochow noodles is fried, some call it char chu mee, fried and cooked noodles. Fried and then water is added to cook the noodles and make up the gravy. Many who do not know how to do it right would fry the noodles, dish out onto a plate and then cook the sauce/gravy and pour over it. Not the same and definitely not as nice. This one is supposed to be a variation of the kampua, and kampua is tossed dry, no sauce, no gravy. Come to think of it, I would not like my spaghetti bolognese swimming in the sauce either – not so watery and just enough to toss the pasta and give it its flavour. I have had several gout attacks and they are extremely painful, so you did the right thing. Been there, done that…but it has been a long while since, not after I retired – at least, 10 years already…and ever since I stopped drinking beer. Praise the Lord! Everything looks good. 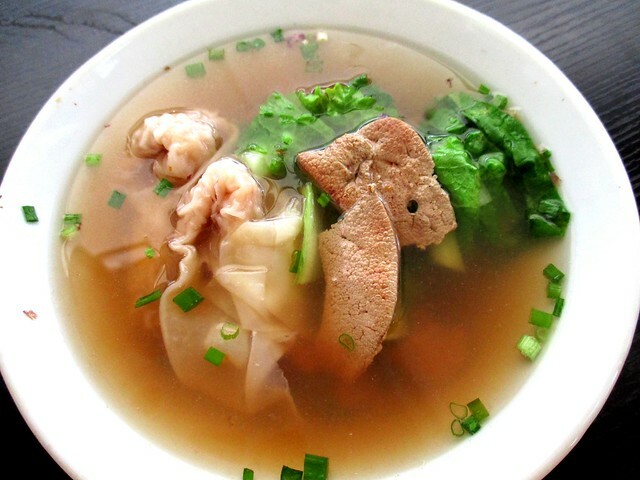 That bowl of pork liver soup is a steal. Love to have it. I enjoyed it very much, nice. Have not have the fish mihun for quite a while now. I dont mind the milk but I would go for the clear broth. 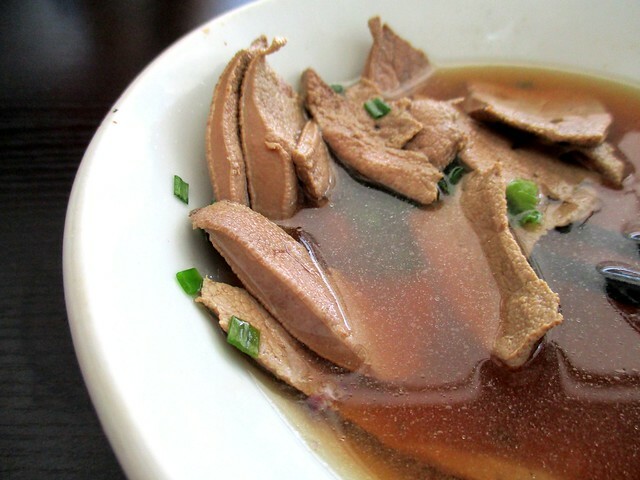 Liver soup. I try to steer away from this but if hubby is around, I am forced to take 1 or 2 slices. A lot of chilli sauce and soy sauce for dipping before I take few bites and try hard to swallow along with my drink. Lol. I dont mind the soup though. I would say that I prefer it clear – this milky soup is KL-style, I think. I do not mind it like this sometimes for a change. Oh? Why does your hubby force you to take liver? He believes it is good for health? Poor you! Like a kid forced to take medicine. Muahahahahaha!!!! The fresh fish mihun looks good. Just like the ones here. Lots of liver! Yums! Your wife doesn’t eat liver? She does but she’s not really into it – would rather not eat but she enjoys the soup! At home, she would surely add a lot of our traditional Foochow red wine – I am not a fan of it too strong, an overkill. Will drown out the taste of everything else. Liver – lamb’s liver? My childhood was filled with Lamb’s Fry – battered, cooked with lots of butter in the fry pan and a bit of a gravy with it. Never had lamb. I like beef and pork liver, chicken not so much as it is softer. Not all that fond of the mushy texture. 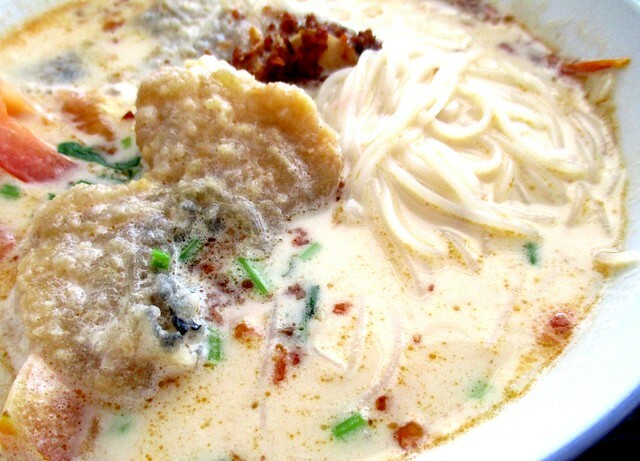 Wow..the creamy fish noodles is a yeah for me! I thought most of the time they will be using fresh fillet instead frozen? Geee…if frozen is a no no for me. It taste awful with the soup. Dory! All the classy cafes here use that, or most of them, at least, for their fish and chips. That is why I never go for that here. Not a fan of dory, the texture…and the smell. Love liver – don’t get too much of it here, unfortunately. I enjoy liver but the ladies in the house are not fans of it so we never buy to cook our own at home. I may have some outside once in a long while. I guess that is all right – moderation is the key. Maybe liver now is very cheap and not many people eat them, not like those days, so that is why your portion of liver is endless… hahahaa… During my younger days, my mom used to do that for us to drink, sliced thinly and put in some ginger, add boiling water and we have to consume them all… to replenish blood… but nowadays, not many people buy, I guess. I don’t know, I never buy but in the mid-70’s, it was very expensive in Sibu – Foochows ate it a lot for nourishment but I was in college in Kuching at that time and those from Sibu would buy a lot everytime they went home. Very cheap there, they said. Maybe Kuching people at the time were already very health conscious so liver was not popular there. I usually skip the liver, not a fan of those. 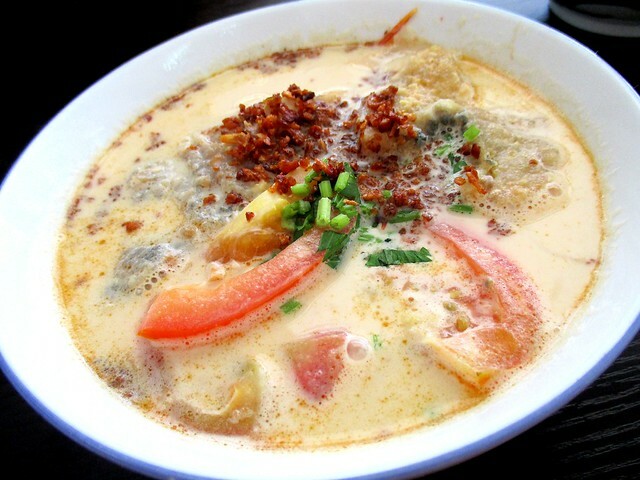 The fish noodles looks good… the soup looks mighty creamy. What about the celebrated and somewhat controversial goose liver? Seems like a trendy and classy thing to fine dine on that, all that snob appeal? I’ll have to pass on the creamy fish head bihun, but the loh bak mee seems alright. I guess it differs from person to person in terms of palate? Indeed. Like I always say – to each his own. One man’s meat is another man’s poison. Pingback: Shining star… – …STILL CRAZY AFTER ALL THESE YEARS! Pingback: Where did she go… – …STILL CRAZY AFTER ALL THESE YEARS! Pingback: Good ’til the last drop… – …STILL CRAZY AFTER ALL THESE YEARS!